To make a holder to hold cones upright, turn an egg carton upside down. Punch holes in 8 of the egg cases to hold the cones. If you don’t have an egg carton, use 8 heavy, narrow-rimmed drinking glasses. Place chocolate chips and oil in top of double boiler over simmering water or in medium bowl over saucepan of simmering water. Melt chocolate, stirring as chocolate starts to soften. Dip and twirl top 2 inches of each cone into melted chocolate; quickly remove and place in holder. Refrigerate or freeze until chocolate is hardened, about 1 hour. In small bowl, beat eggs with electric mixer on high speed 3 minutes. Gradually beat in sugar; beat 1 minute longer. In 2-quart saucepan, heat 1 cup of the whipping cream over medium heat just until hot. Gradually stir at least half of the hot cream into eggs, then stir back into hot cream in saucepan. Cook over medium-low heat about 10 minutes, stirring constantly, until mixture thickens (do not boil). Stir in remaining melted chocolate from dipping cones. Cover; refrigerate about 1 hour, stirring occasionally, just until chilled. In chilled medium bowl, beat remaining 1 cup whipping cream on high speed until stiff. Fold chocolate mixture into whipped cream; refrigerate up to 1 hour before serving time. 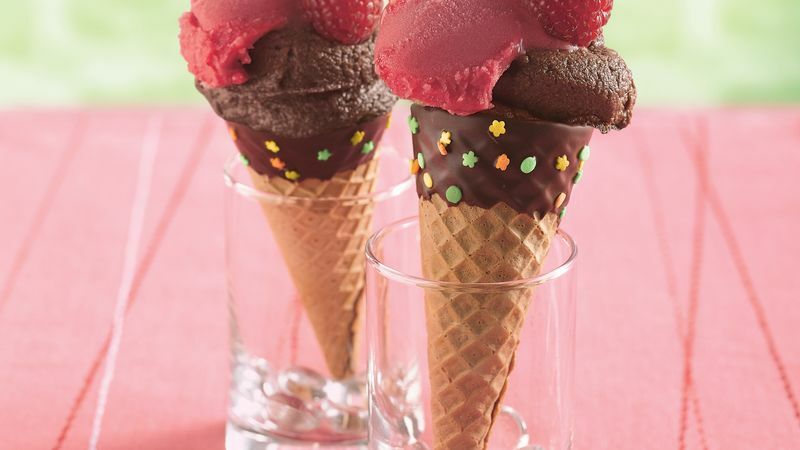 Spoon chocolate mixture into cones, place 1 small scoop sorbet on top of each. Garnish each with fresh raspberry. Fill the cones with mousse just before serving time. You'll wind up with about 1 cup of mousse left over to use at a later time. Decorate the outsides of the cones with colored sprinkles before the chocolate hardens. Drop a specialty candy into each cone before adding mousse for a surprise treat!